The model 9112 12-sheet cross-cut shredder features a three function control switch; auto, forward and reverse. The Honeywell model 9112 12-sheet cross-cut shredder also features capabilities to shred CD's, credit cards, staples and 12 sheets of paper at a time. 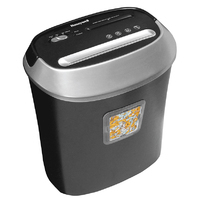 This shredder has a separate basket for shredded CD's and credit cards for proper disposal. It is U.L. (Underwriter's laboratories) listed and tested.